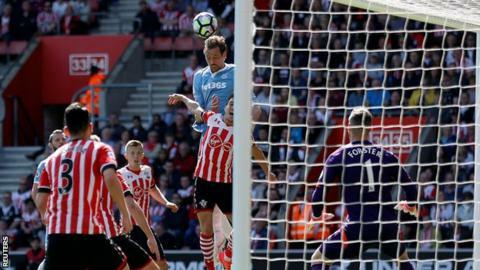 Southampton's miserable home form continued as Peter Crouch struck the only goal of the game to help Stoke to a first away win since January on the final day of the season. The home side enjoyed the majority of possession but Nathan Redmond's lob on to the bar on the stroke of half-time was their best moment until Crouch pounced. The striker's 10th goal of the season arrived when he headed home a Geoff Cameron cross and they deserved the lead after creating openings throughout. Southampton rallied late on as Jack Butland produced fine saves to deny Steven Davis, James Ward-Prowse and Sofiane Boufal but Claude Puel's side end the campaign without a win in five games at St Mary's. The Frenchman has been criticised by some supporters for a lack of entertainment in recent months and closing the season without a home league goal in over seven hours will do little to change such views. His side end the season eighth, with their lowest points tally since 2012-13, while Stoke finish 13th, their lowest finish since the same season. Puel will now be one of the managers whose future is in the spotlight. His board have not leapt to his defence in recent weeks.. But he did guide Saints to the EFL Cup final - a first major final since 2003 - and they have not fallen lower than 13th in the table since October. Given they lost central defensive partners Virgil van Dijk and Jose Fonte in January, to long-term injury and transfer respectively, perhaps such consistency merits greater praise. Van Dijk's future at the club will be resolved this summer, with high-profile clubs linked to him, while Ryan Bertrand's impressive campaign could also attract rivals. But it is at the other end of the pitch where Saints fans will want reinforcements. Their side are the lowest scorers in the top half of the table and against Stoke that lack of cutting edge was clear. Although Redmond pounced when Butland lost possession to chip the keeper and hit the bar, it was only late on that the home side actually began to create chances for themselves. Manolo Gabiaddini wasted their best when Butland denied him one-on-one. Puel called the display a "little picture of the season" but declared himself "satisfied with eighth. Though the customary end-of-season lap of honour was conducted in front of a stadium less than a third full. Hughes will be thrilled at his 150th Premier League win as a manager - if only because it was just a second victory in 11 matches. But his side looked well organised and used possession effectively, with Mame Biram Diouf seeing a shot saved and a header cleared off the line before the break. Crouch saw little of the ball - just 16 touches before he converted Cameron's pin-point cross - but when involved, his presence caused problems and only a last-ditch Maya Yoshida tackle denied him a chance in the first half. With Wilfried Bony - who has not played since December - set to return to parent club Manchester City, the Potters will hope Saido Berahino can assist 36-year-old Crouch more ably next term. He is still waiting on a first goal for the club since joining from West Brom in January. The club's board have promised to back Hughes in the transfer market, though they may expect a better return than 13th after three ninth-placed finishes in a row. A better start will go a long way to help, as they played catch-up throughout the campaign having been winless in their first seven league games. But after this deserved victory, Hughes emphasised that his side were just two points off eighth place and said he expects an "evolution" not "revolution" this summer. Retaining Butland looks a necessity and his double save to deny both Davis and Ward-Prowse to maintain the lead summed up the resistance Hughes needs to see more of in 2017-18. Butland gave his gloves to fans after a superb display. He was fortunate to escape when Redmond hit the bar after an error but six saves was an impressive tally. His late heroics earn the man-of-the-match award ahead of Bruno Martins Indi, who looked strong at the heart of the defence and produced several key interventions in the first half. Peter Crouch becomes the first player to score 50 headed Premier League goals. Southampton have now failed to score in six of their last eight Premier League matches. The Saints have failed to score in five consecutive home league games for only the second time in their history. They also did so in September 1937. Mark Hughes becomes the seventh Premier League manager to notch 150 wins (Ferguson, Wenger, Redknapp, Moyes, Allardyce and Mourinho are the others). Southampton manager Claude Puel: "To finish eighth is good. The game was a little picture of the season - many opportunities and possibilities without scoring. "Sometimes there is disappointment because often there was good football without reward. I am satisfied for all this season." Stoke manager Mark Hughes: "We wanted to finish in the correct manner and I think it was a really honest performance. Jack made a couple of saves towards the end. We needed him to come to the fore and he did. That's what a top keeper does for you. "If you look at where we finished, 13th, I think we are two points away from eighth. Fine margins. We will be better next year. It's not going to be revolution but evolution for us. There won't be wholesale changes." Match ends, Southampton 0, Stoke City 1. Second Half ends, Southampton 0, Stoke City 1. Attempt saved. Oriol Romeu (Southampton) header from the centre of the box is saved in the centre of the goal. Attempt blocked. Steven Davis (Southampton) left footed shot from the centre of the box is blocked. Attempt blocked. Steven Davis (Southampton) right footed shot from outside the box is blocked. Substitution, Stoke City. Marc Muniesa replaces Xherdan Shaqiri. Xherdan Shaqiri (Stoke City) is shown the yellow card. Substitution, Southampton. Jérémy Pied replaces James Ward-Prowse. Manolo Gabbiadini (Southampton) wins a free kick in the defensive half. Dangerous play by Peter Crouch (Stoke City). Corner, Stoke City. Conceded by Steven Davis. Attempt blocked. Joe Allen (Stoke City) right footed shot from outside the box is blocked. Assisted by Jonathan Walters. Corner, Stoke City. Conceded by Cédric Soares. Corner, Southampton. Conceded by Joe Allen. Attempt saved. Manolo Gabbiadini (Southampton) left footed shot from very close range is saved in the centre of the goal. Assisted by Oriol Romeu with a headed pass. Corner, Southampton. Conceded by Jack Butland. Attempt saved. Sofiane Boufal (Southampton) left footed shot from the centre of the box is saved in the centre of the goal. Assisted by James Ward-Prowse. Offside, Stoke City. Joe Allen tries a through ball, but Peter Crouch is caught offside. Attempt missed. Peter Crouch (Stoke City) right footed shot from the centre of the box misses to the right. Assisted by Erik Pieters. Attempt saved. Manolo Gabbiadini (Southampton) left footed shot from the centre of the box is saved in the centre of the goal. Assisted by Steven Davis with a through ball. Attempt missed. Jonathan Walters (Stoke City) header from the right side of the box is high and wide to the right. Assisted by Xherdan Shaqiri with a cross following a corner. Corner, Stoke City. Conceded by Ryan Bertrand. Xherdan Shaqiri (Stoke City) wins a free kick on the right wing. Offside, Stoke City. Xherdan Shaqiri tries a through ball, but Ryan Shawcross is caught offside. Attempt saved. James Ward-Prowse (Southampton) right footed shot from the centre of the box is saved in the bottom left corner.